Includes a trapdoor in the tower, and a drawbridge to protect against possible enemy attack. A functional hoist, king`s throne and prisoner`s dungeon are also included. Playmobil's Knight's Empire Castle uses the company's new SystemX, which is designed for shorter assembly time and durability. 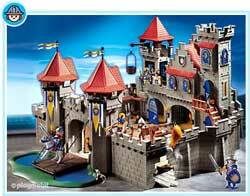 Comes with a working gate and dungeon and looks like the classic friendly Playmobil settings of years past. Suggested add-on, the Red Dragon (because you always need a dragon), is sold separately. Projectile cannons sold separately. Most kids love the action of projectiles until one hits them. When the drawbridge has been sealed using the winch the magnificent castle is impervious to attack. 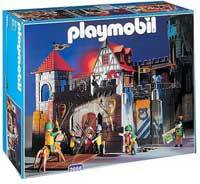 The thick walls are built with the PLAYMOBIL snap-together system and can be set up in many different ways. With the swiveling, working rope and pulley system and large transport tub anything can be raised or lowered. The living quarters are protected by 2 towers and battlements surrounding almost the entire castle. Every tower has a trap door. Numerous figures include a king and serving maid, plus many other accessories. 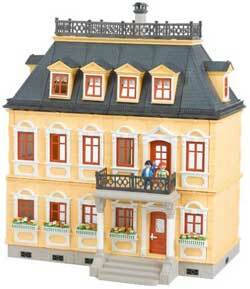 Part construction set/mostly pretend setting, Grande Mansion has two stories and a usable attic; this yellow house has an old world charm. Younger kids will need help with assembly. Interlocking wall assembly system. Offers lots of play value!